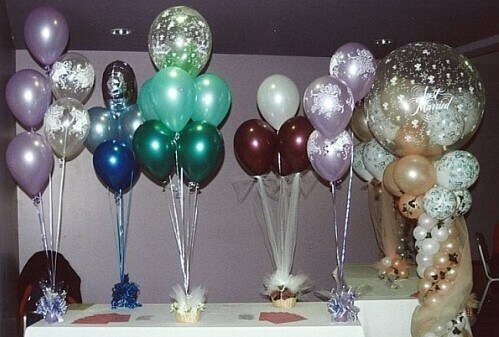 In recent years, the balloon centerpiece has become a popular way to decorate special events, like weddings, anniversaries or birthday parties. Also called balloon bouquets, they are simple to make and inexpensive. If you are struggling for a way to decorate your wedding reception, balloon centerpieces can be just the right solution for you. Groupings of balloons and small balloon columns make great wedding centerpiece ideas. 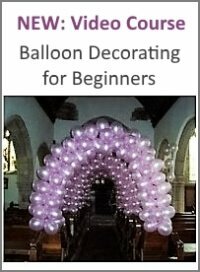 If you are inflating balloons with helium to float in groupings above the sitting space, you should anchor them to the table with unique table bases. A lot of people like the look of balloons as wedding decorations because they are less formal than flowers, but still give the ceremony and reception an elegant touch. See our step by step instructions for the Bouquet 'Simple & Elegant', an ideal centerpiece for wedding table decorations. In addition to decorating a room or special event with balloons, you can make a good gift into a great one by adding balloons. Imagine a perfectly wrapped package, complete with ribbons and bows. Now imagine how much better it would look connected to a playful group of colorful balloons. Kids will feel as if they are receiving two gifts for the price of one! Creating a bouquet of balloons and connecting it to a package is simple. You can do it for just about any occasion. 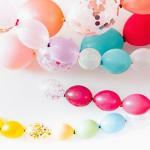 Try a group of multi-colored balloons for a birthday gift, or red and white balloons for Valentine's Day. Centerpieces are a great way to dress up for special occasions. Most guests will be expecting fruit or flowers, so when they see a table featuring creative groupings of balloons surrounded by the delicious holiday feast, they will be surprised. 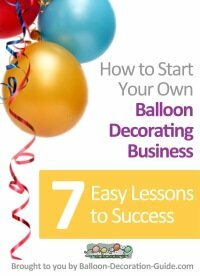 Decorating tablescapes with balloons can be as simple or elaborate as you choose. A small bunch of red and green balloons adds a festive flair to your Christmas table or to your Christmas wedding decoration. A picnic table strung with red, white, and blue balloons adds a patriotic touch to any Independence Day celebration. Black and orange balloons with a pumpkin, black cat, ghost or bonehead as topper make for a cute or spooky Halloween balloon decoration. Balloons offer a one of a kind touch to the table, and making them can be a family project. The night before your party, gather your children and the necessary supplies. Together you can create a unique centerpiece for the party table. 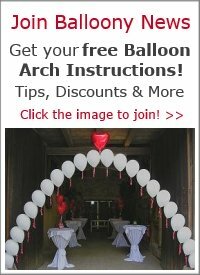 Whether you are looking for unique wedding table decoration ideas, seeking a way to jazz up gifts, or add to the holiday tablescape, balloons will help you put together the perfect creation. Balloons are reasonably priced and fun for everyone. The next time you are planning a special event that calls for decorations or gifts, create a bouquet of balloons that fits the theme.